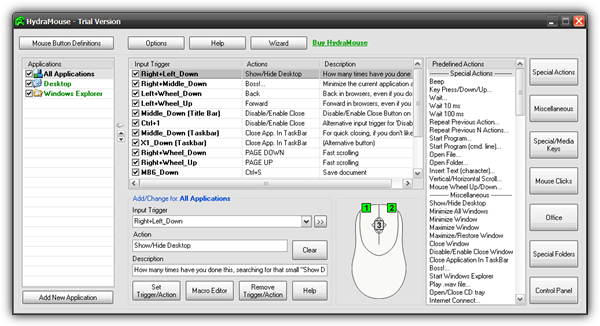 Any computer user would know that the default actions for the mouse button are left click to select, right click to show the context menu and the rubber wheel in the middle is used for scrolling. There are applications such as web browsers where you can zoom in or out of the page by simply holding the CTRL key while scrolling. Some advanced mice like the Razer Ouroboros have up to 11 buttons which are programmable using software called Synapse which obviously can only be used for the Razer mouse. These additional mouse buttons can greatly help in gaming or navigation so you can achieve what you want by just a click without moving your mouse or pressing a key on the keyboard at all. Even if you just have a standard mouse with 2 buttons and a scroll wheel, you can actually change and customize the mouse button actions using the right software. Here we have 4 ways on how you can assign various predefined actions to the mouse buttons. 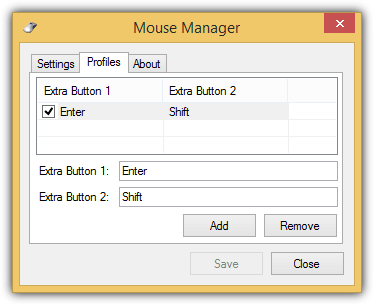 If you have a 5 button mouse and looking for a simple Windows application that allows you to set any keys or combinations to the 4th and 5th button, Mouse Manager might be your best choice. It doesn’t have all the advanced commands or actions which you can select from, instead you can easily set keys for the buttons by pressing the keys on your keyboard. Mouse Manager also supports multiple profiles which allows you to conveniently switch different keys for the 4th and 5th button without the need to edit the current configuration. If you’re confused which are the 4th and 5th buttons on your mouse, any additional buttons other than the left click, right click and the scroll wheel will be considered as the fourth and fifth button by Mouse Manager. HydraMouse is a very powerful software to assign actions to mouse buttons. Some of the predefined actions included in the program are the ability to open control panel applets, accessing frequently used folders such as Desktop, pressing combination of shortcut keys such as copy/paste/cut/save, mouse click simulation, media keys to play/pause/stop/control volume, and other miscellaneous actions to open/close CD tray, minimize/maximize window and etc. The only drawback in HydraMouse is its a shareware but they do have a free version that restricts up to 3 items in the application list which is all applications, desktop, and Windows Explorer. HydraMouse also comes with a powerful macro editor to create complex sequences of actions that can be executed with a click of a mouse button. Compared to HydraMouse, X-Mouse Button Control is totally free and does not have any limitation to its functionality. You can add specific applications to be monitored by X-Mouse Button Control and up to 5 layers (profiles) with over 80 different actions that can be set on the mouse buttons. The “Simulated Keys” action can be used as a macro to simulate keystrokes and mouse actions through the supported tags. The settings allow you to configure miscellaneous options such as scrolling background window, changing the mouse speed, hotkeys to switch between layers and etc. Unlike HydraMouse, X-Mouse Button Control only supports up to mice with 5 buttons. 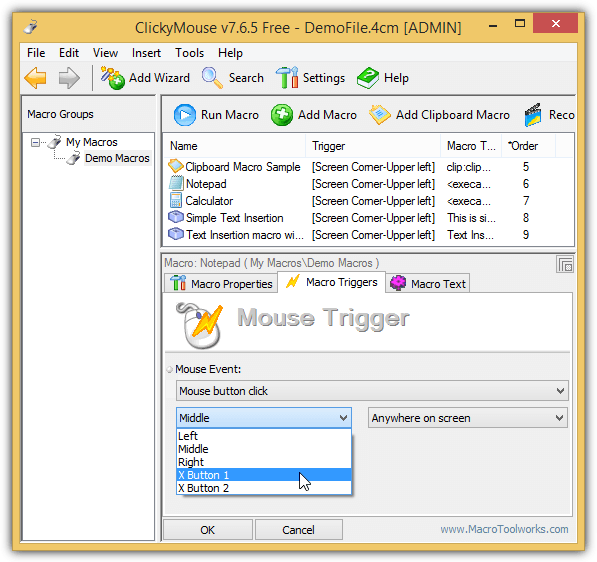 The free edition of ClickMouse allows you to assign macros to your mouse events such as during clicking or double clicking the mouse button, holding the mouse button, shake horizontally or vertically, scrolling mouse wheel forward or backward, and moving the cursor to the screen edge or corner. As you can see from the screenshot below, only 5 buttons (left, middle, right, X1 and X2) can be assigned a macro. ClickMouse isn’t as easy to use as other where you only need to select an action that you want to map to a mouse button. Instead, you need to create the macro first either through an automated recording or manually insert the macro commands and system variables in the Macro Text tab. Once the macro is created, you will then need to assign how your mouse will trigger the macro from the “Macro Triggers” tab. Some bad reputation out there on HydraMouse… (the free version at least). I run into some security warnings myself when going to download. I have not independently verified this, but thought it might be worthwhile mentioning. I was warned by Trend Micro Security. Virus Total gives the website and the executable a 100% clean bill of health, not even any false positives. this looks great for most, but I am using this “Blackweb 7 Button Programmable Mouse” and it is not very programmable. Can’t find the software anywhere… my main issue is that it has a windows button on the lower thumb rest area and I’m getting tired of seeing the windows screen pop up every time i put the mouse down a little to quickly and I press the little button. I thought it would be a neat button for some games I play (and maybe some editing shortcuts like Ctrl+B for Bold, but now i am getting frustated running through settings and mouse bind software that doesn’t even recognize that there are 7 buttons on the mouse, only 5! Thanks for the good work, but if someone is reading this ready to buy the cheap Wal-Mart brand, I do not recommend it. Wow very cool link, thanks so much! I purchased this generic wireless mouse last spring and it has been annoying me ever since. I live in a motor home in the winter months, avoiding the snows and cold of the Dakota’s by fleeing to west central Arizona, in the Mohave Desert(local spelling) I use the mouse all the time but I keep bumping those side buttons, which are the last page, next page from the factory. I do a lot of watching Utube to pass the limitless hours that God keeps giving us here in the desert, and play a few games from time to time and that is just plain annoying. The mouse came with no drivers and I could not find any for it, but this program is just what the doctor ordered. Now I can use the mouse the way I want to use it, not some dude in China where it was made. Thanks for this return to freedom! Didn’t Windows used to have a mouse driver button selector, back when we used Windows 98 SE? Thanks a lot Raymond, seriously. HydraMouse is best software for what I needed to do, it recognizes both modes my mouse has (normal and multimedia) so I was able to configure the second mode with ease. Hi – I use a Trust 5 button mouse, mainly for AutoCAD, but whilst it works perfectly well in older versions of Windows, in the more recent versions, I can’t get the 4th and 5th buttons to work – I think the Windows mouse drive (which doesn’t have the extra buttons) overrides my Trust driver. Any ideas on how to make my Trust driver the default one please? Thanks man for introducing HydraMouse. It’s latest Pro version 3.2 enable me to do lots of keyboard + mouse macros to increase my productivity and repetitive tasks. Sorry but, does X-Mouse Button Control include all letter/number keys? As, after downloading it, when trying to assign the differing keys to my 5th and 4th mouse buttons, I can’t seem to find them. Thank you… Been looking for these added functionality for few days.. Very helpful . Thank you very much Raymond for sharing. love it man….nice software…and it’s also free!!! Thanks so much! This is a really great program! I was searching for a program like this for a very long time! I use a Logitech mouse, but refuse to download and install the 60MB setpoint driver. Talk about bloatware. So I am stuck with simple left and right clicks and the basic scroll wheel. Too bad this program will not detect the tilt wheel on the Logitech mouse. you think 60mb is bad? did you post that in 1970? thanks raymond that was a good one. Another great alternative for logitech mouse owners is uberoptions. It expands any logitech mouse with all the options and facilities of more expensive mice, and much like this program has a great collection of actions, including macros, and it enables application specific actions for mice that don’t have it enabled by default.